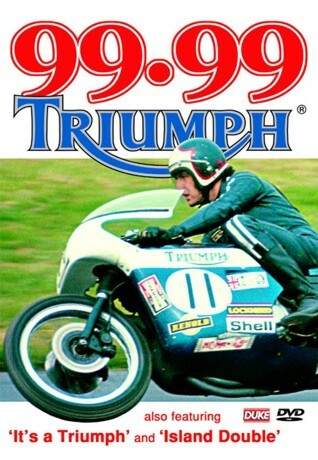 A fantastic and nostalgic DVD dedicated to the history of one of the most famous motorcycle marques-Triumph. The DVD features three films, celebrating the contribution made by Triumph to the two-weeled world. The first “It’s a Triumph” is a fascinating tour in black and white around the former Triumph factory during the early post war years. Film 2: “99.99” features the famous marque during the 1969 TT Production Race held on the Isle of Man. In film 3, “The Island Double”, you will enjoy memorable races from the 1972 TT Series. First the Production for 750, 500 and 250cc classes, then the big 750cc Formula event. It was ‘No Contest’ with Pickrell breaking the lap record at 105.68 mph!